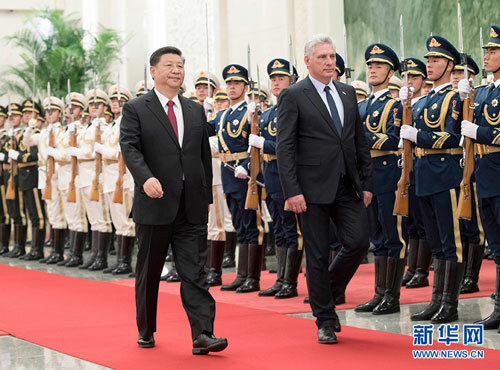 BEIJING, Nov. 8,Chinese President Xi Jinping held talks with visiting Cuban President Miguel Diaz-Canel here on Thursday, calling on the two countries to cherish their traditional friendship and write a new chapter in China-Cuba friendly cooperation. Xi extended welcome for Diaz-Canel's first state visit to China and asked Diaz-Canel to convey his cordial greetings to Raul Castro, first secretary of the Central Committee of the Communist Party of Cuba. Hailing Cuba as a great country, Xi said it has won the respect of the world by insisting on its own development path despite difficulties and obstacles over the past half a century. As socialist countries, China and Cuba are good friends, comrades and brothers, said Xi, adding this is a proven fact and the relationship has withstood the test of time and international situation changes. "Chinese people will never forget that Cuba, led by Comrade Fidel Castro, was the first nation in the western hemisphere to forge diplomatic ties with China 58 years ago," Xi said, expressing gratitude to the Communist Party of Cuba and Cuban people for their firm support to China in safeguarding sovereignty and developing the country. Xi recalled his two visits to Cuba and in-depth conversations with Fidel Castro, calling on the two countries "to double cherish the friendship forged and cultivated by the older generations of leaders, to inherit and develop it and jointly write a new chapter of bilateral friendly cooperation." 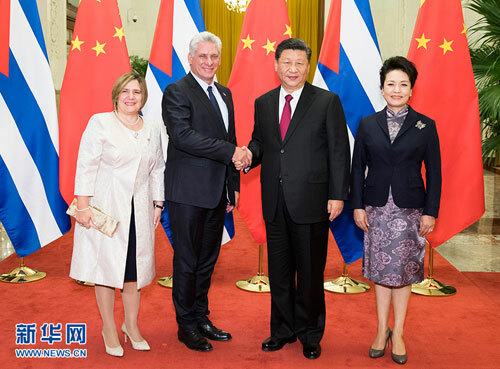 Speaking highly of the unswerving determination of the Cuban party, government and people to develop bilateral ties, Xi said both sides need to have an overall plan from a long-term perspective so as to promote the in-depth development of China-Cuba ties. He called on both countries to further consolidate mutual trust and support, conduct win-win cooperation and enhance exchanges on governance. The two countries should continue to support each other on issues concerning core interests and major concerns, said Xi, adding that China firmly backs Cuba on safeguarding its national sovereignty and choosing a socialist path that suits its national situation. China believes that with the strong leadership of Raul Castro, Diaz-Canel and other leaders, Cuba will surely score new achievements, said Xi. He said China appreciates Cuba's contribution to the relations between China and Latin American and Carribean countries and would like to maintain close coordination with Cuba on major international and regional issues. China welcomes Cuba's participation in the Belt and Road construction, said Xi, calling on both sides to enhance cooperation in areas of trade, energy, agriculture, tourism and biopharmaceutical manufacturing. Noting that Diaz-Canel visited the first China International Import Expo held in Shanghai prior to his arrival in Beijing, Xi encourages Cuba to make the best use of the expo to expand exports to China. "China's cooperation with Cuba follows the principle of upholding justice and pursuing shared interests," said Xi, adding that China will "support Cuba in all aspects that we can support." He also called for people-to-people and cultural exchanges so as to boost mutual understanding and friendship between Chinese and Cubans, especially for the young people. 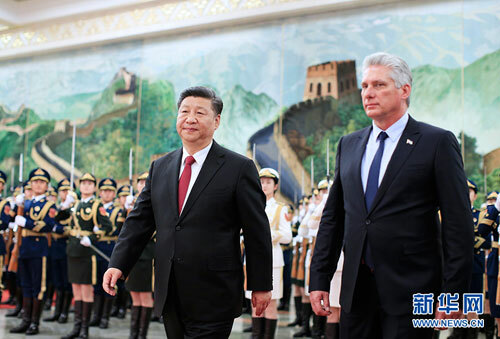 Diaz-Canel, who arrived in Shanghai Tuesday to start his three-day state visit, said that Cuba appreciates China's lasting support and the new generation of Cuban leaders will staunchly continue the traditional friendship with China. He said Cuba admires the achievements China has scored and highly agrees with the development ideas put forward at the 19th National Congress of the Communist Party of China. Cuba is willing to learn from China to update its domestic economic and social model and promote the cause of socialist construction, said Diaz-Canel, calling on the two countries to maintain high-level exchanges and political dialogue, strengthen exchanges in trade, education and culture and enhance communication and coordination in international affairs. Prior to the talks, Xi held a welcoming ceremony for Diaz-Canel at the Great Hall of the People. After the talks, the two leaders witnessed the signing of a series of documents.